QHSE – Quality, Health Safety and Environment | Sensor Technology Ltd. QHSE – Quality, Health Safety and Environment | Sensor Technology Ltd. The number one objective of Sensor Technology Ltd. is quality. Our definition of quality is simple: we aim to produce parts that meet or exceed all your performance specifications, consistently, shipment after shipment. Whether we’re shipping acoustic transducers, hydrophones or piezoelectric ceramics, our goal is to ensure that our components contribute to the reliability and repeatability of your products. 2.) provide our customers with consistent, high quality products, on time delivery and uncompromising service. 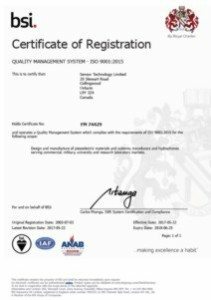 Sensor Technology Ltd. maintains an ISO 9001:2015 compliant Quality Management System. Our quality assurance practices establish and maintain effective controls for monitoring both our production processes and our equipment. We collect feedback on the state of the controls and use statistical techniques to further improve quality. By combining preventive action and corrective action programmes we continuously improve our internal systems and production processes. Download Sensor Technology Ltd.’s ISO 9001:2015 certificate. We maintain batch level traceability (lot numbering) by default and can provide individual unit traceability (serial numbering) upon request. Our systems trace all production steps, operators and inputs for everything we produce, all the way back to the raw inputs for our piezoelectric powder. To provide a clean and safe working environment our QHSE programme is actively administered through the Sensor Technology Ltd. Joint Health & Safety Committee. The committee is composed of both management and production employees. To ensure employee safety committee members perform routine audits of the production facility. They look for areas of concern and canvass all staff for feedback. Additionally, air quality monitoring in the production areas and regular medical checks ensure the health of our employees. As part of Ontario’s Toxic Reduction Plan Reg 455, Sensor Technology Ltd. has developed a programme for the reduction of lead waste and is targeting an annual lead waste reduction of 1%. You can view our 2016 Annual Toxic Reduction Public Report.